Morning! Hope everyone tried some of the release techniques I posted yesterday. I promise self myo-fascial release works…you just have to be consistent with it. In a lot of instances a person does not realize that have tightness in a certain area. For example, your hip could be hurting. 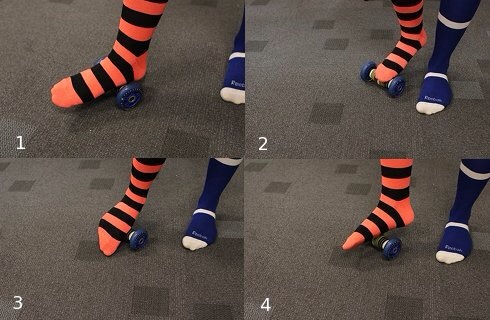 It’s fine to roll the hip, but rolling the foot, calf, I T Band or hamstring could bring greater relief. Remember, our muscles should be working in better unison. For today a few more body parts to work on. 1. Place the Quadballler just above your knee. 2. Lie down and prop yourself up on your forearms. Roll the Quadballer up and down your quad, stopping on any trigger points. Gently rock side-to-side. 3. In addition to rocking side-to-side on hot spots, bend your leg back at your knee. Hold for a few seconds. 4. Straighten your leg. Hold. Alternate bending and straightening your leg on your hot spots on your quad. 1. 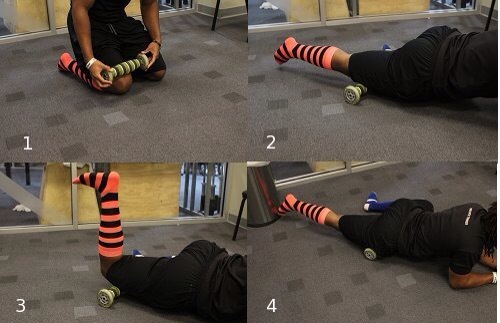 Start with foam roller near your knee on the inside of your thigh. 2. Roll up towards your groin, stopping on any trigger points. 3. 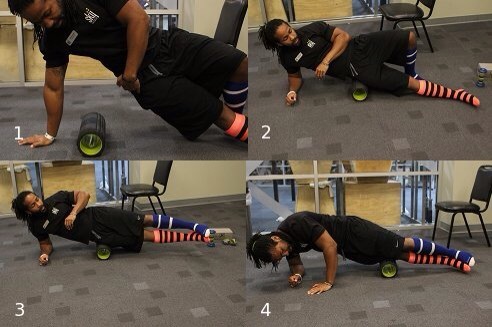 With the foam roller, you can go higher up your adductor than you can with a Quadballer. Repeat on other leg. This is my favorite trigger point release exercise. If you run a lot, chances are you’ve experienced “runner’s knee.” Runner’s knee is caused by a tightening in your Iliotibial band, or IT band. The IT band is a thick band of fascia running on the side of your leg from your knee to your pelvis. Massaging your IT band can help loosen up tightness and prevent future injuries. Take it easy when you’re first starting out rolling your IT band. It’s going to hurt. 1. We’re going to roll the foam roller up and down the side of our leg starting at the top of the hip and down to just above the knee. 2. Lean back on your arm and bend your non-treated leg for added support. Roll up and down IT band, stopping on any hot spots. 3. If you really want to dig into those trigger points, lift both legs off the ground. Grimace. 4. In addition to applying steady pressure on hot spots, rock side-to-side on them. Repeat on other leg. There ya go. Foam rolling is uncomfortable but so worth it. Being able to treat yourself with these techniques will help keep you running, biking, playing tennis or whatever activity you do longer. Start rolling!. Also, if you do see a massage therapist it helps there work last long. Excited to have finished my class from THE BIOMECHANICS METHOD. This certification enables me to better evaluate posture and muscular imbalances in the body. TBMM also helps me better to prescribe corrective exercises, stretches etc. to help the affected areas. This certification will be the perfect compliment to my FOUNDATION TRAINING work. Working with clients to improve posture, muscle imbalance and overall movement patterns is awesome. If you have body pain, back pain, poor posture, elevated shoulder, tight hips, tight hamstrings, weak ankles and other body issues….contact me. Sometimes just taking a good look at your body and your habits…then applying some changes will make a world of difference. We are meant to move! We all have to eat, sleep, work and play in the body we were given. If it is broken down a little bit…let me help you rebuild…it is not to late! A staggering 80% of the American population suffer from back pain. Back pain is very real condition that is usually re-occurring on a regular basis. Most people pop a pill to relieve the symptoms. Everything from Advil to narcotics. This is not the way to fix what is causing back pain. For those of you who suffer with back pain here are some ways to manage the pain and start focusing on treating the cause of the pain…not just the symptom. The first thing to do is correct your posture. Find a trainer, movement specialist, who can help you correct the way you carry yourself. The way we carry our frame is a leading cause as to why we hurt. Release your feel good hormones thru aerobic exercise . Get a massage to help relax muscles and stimulate blood flow. Try chiropractic care, accupuncture, deep breathing to bring in oxygen to the tissue and cells for healing. REST! Get plenty of good sleep. The body needs rest. Exercise. There is just no way around it…everyone needs to do daily exercise. This is the perfect opportunity to learn FOUNDATION TRAINING! Once you know how to perform FT…take a 5 minute break at work and apply FT. At lunch do a FOUNDER…perfect for getting the hamstrings refreshed. FOUNDATION TRAINING will keep back pain at bay! There is always the go to ice/heat treatments. Cold to reduce swelling and to slow down pain signals. Heat to relax. Don’t forget a good warm Epsom salt bath! We have to stop the mind set…take a pill or go to bed to fix our pain issues. The only way to fix pain issues is to find the source then begin a regimen of the above treatments. You will be amazed at what a little knowledge about your body will do for you. MAKE THE NECCESARY POSTURE CORRECTIONS TO GET OUT OF PAIN! Dorsi Flexion is the ability to lift the ball of your foot up towards your ankle. Give it a try right now. Stand up evenly balanced. With one foot lift the toes and ball of foot upward without shifting your body. Tougher than you thought? The inability to produce enough dorsi flexion can cause a lot of gait issues and muscle imbalance. Those of you who can not dorsi flex adequately most likely over pronate also. You over pronate to compensate the lack of dorsi flexion. Again, this is how all kinds of muscular problems happen and lead to joint pain and overall body pain. Flexibility issues with the Gastroc/Soleus complex (muscles of the calf). Ankle joint restriction. This can be due to a tight joint capsule and/or scar tissue and adhesions in the joint from prior injuries or surgeries. Anterior pelvic tilt posture. Bad posture (how often do you slouch when you’re sitting at your desk?) brings the body’s center of mass forward, which causes the ankle to plantar flex in an attempt to balance it out. Ladies wearing high heels all the time. This puts the foot in extension for long periods of time and tightens the calf for long periods of time. What to do about lack of dorsi flexion? First, you may want to see a foot doctor or some type of movement coach, personal trainer or therapist who can give you exercises. 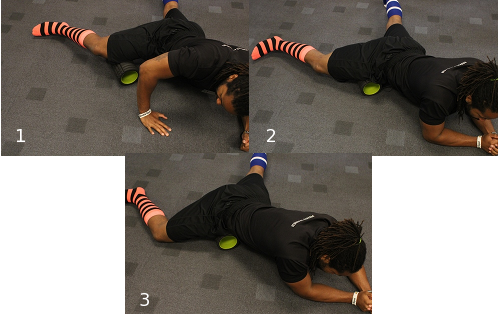 Secondly, learn some self myofascial release techniques. 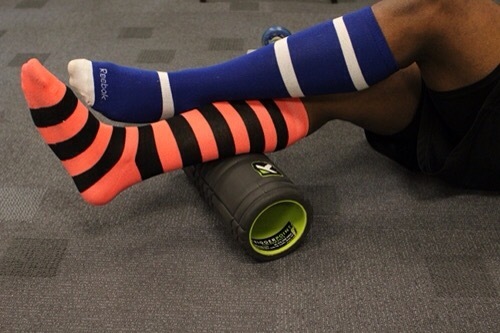 Use a foam roller on your shin and your calf. Use a tennis ball or golf ball on your foot. This will help loosen some of the soft tissue so that you can add some stretches. Thirdly, learn Foundation Training. 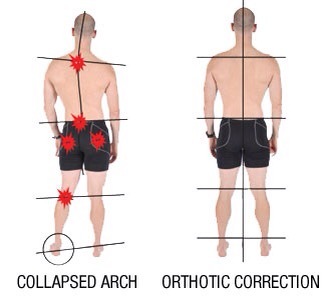 FT on a regular basis will have you dorsi flex, stretch the calf and the whole posterior kinetic chain. In time you will have more mobility and flexibility which leads to better movement patterns and less pain. If you are in pain, bent over, have poor posture or really any body issue…contact me. Let me help you feel better. I work with an awesome network of practionors. You do not have to stay in pain! STRETCHING… A widely debated topic. Should you stretch- should you skip it? I, for one stretch. I am somewhat old school and apply new school techniques. I teach my clients to stretch…properly. In my opinion, stretch the sections of your body to integrate complimentary muscular chains. Therefore, for example if stretching your hamstring…get your hip, calf, foot, and breathing involved. This is how Foundation Training works. FT, is very powerful, very muscular, very integrated and very complete. Stretching has many benefits. First, it increases circulation. This allows for transportation of nutrients to muscles and ligaments. Stretching will improve flexibility and mobility. If a muscle can loosen up…it will move more easily. The better range of motion we have the more mobile we are. Stretching reduces stress…especially FT stretching. The decompression breathing technique is off the chain. Breathing properly reduces stress, increases oxygen intake, expands the rib cage and just makes you feel good! Foundation Training, Will help alleviate many aches and pains in the body…especially back pain. Many people still do not know about Foundation Training. Many doctors do not know…so they are still giving people pills and shots. Many therapists do not know about Foundation Training…so they are still giving isolated stretching exercises. FOUNDATION TRAINING needs to be in every medicine cabinet, gym bag, fitness facility, and therapy office.. FT works! Contact me today if your want to do something different that will cure those aches and pains.